Gingivitis is the earliest stage of gum disease, which can progress into periodontitis (periodontal disease) if it goes untreated by your family dentist. 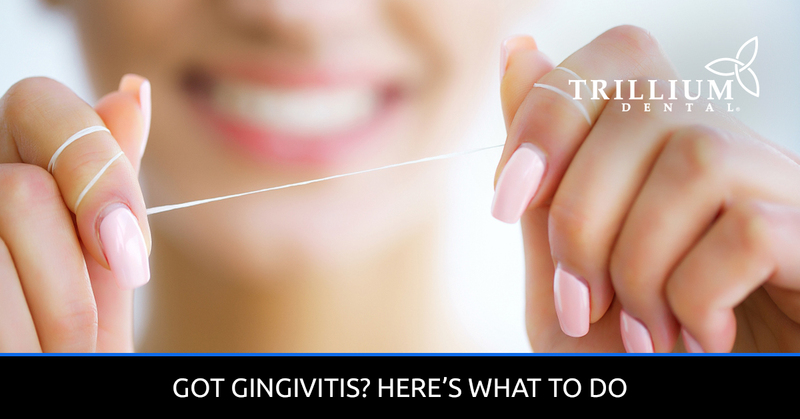 However, it’s not all bad news if you start to notice the signs and symptoms of gingivitis — in fact, many patients are able to reverse gingivitis if they take the right precautions and maintain good oral hygiene habits at home. At Trillium Dental in Ottawa, we provide gum disease treatments for patients who are suffering from gingivitis or periodontitis, so please don’t hesitate to contact us if you have symptoms. That being said, here are some steps to take if you have early-stage gum disease. We are fortunate to live in a time where we have access to all kinds of information at the touch of a finger, but this often leads people to self-diagnose when it comes to dental problems like gingivitis. However, if your gums start to cause you pain, looking up your symptoms is a good place to start. The most prominent symptoms of gum disease in its onset are gum recession (revealing more of your teeth, making them look longer), inflamed gums that are red, tender, and bleed easily, loose teeth, painful chewing, heightened tooth sensitivity, and bad breath that doesn’t go away with normal brushing and flossing. If you have one or more of these symptoms, it’s time to visit your family dentist for a professional teeth cleaning and full dental exam. If your dentist concludes that you are developing gingivitis, they will discuss treatment options with you in order to help reverse the damage it has done to your teeth and gums. Most often, gingivitis is a result of poor oral health, whether that be neglecting to brush and floss, not visiting the dentist, smoking cigarettes, binge drinking, or a combination of these factors. When plaque builds up on your teeth and gumline due to negligence, it turns into tartar, a calcified deposit that eats away at the tooth enamel and can only be removed with specialized dental tools via tooth scaling. Then, it’s up to you to maintain good brushing and flossing habits to keep the plaque at bay. Ideally, you should be brushing your teeth at least twice per day (for a duration of two minutes), as well as flossing daily. When you visit our Ottawa dental clinic, our dentists may recommend an antibacterial toothpaste and mouthwash if you have gingivitis. These oral health products help to fight bacteria and plaque throughout the day and night for long-lasting protection. Bacteria can hide in spaces that are hard to reach, like along the gumline and between crowding teeth, and an anti-gingivitis toothpaste and mouthwash can help eliminate it. If you are interested in learning more about gingivitis treatments and over-the-counter oral care products, our dentists and dental hygienists would be happy to discuss this with you at your next dental appointment. Of course, prevention is key when it comes to gingivitis, tooth cavities, and other painful dental problems. So, make sure to prioritize your oral health with regular visits to the dentist and thorough brushing and flossing, as well as limiting the sugary foods that feed harmful mouth bacteria and turn into plaque. At Trillium Dental, we care about your oral health, and our dentists are here to aid in gingivitis prevention and provide gum disease treatments for our patients. Contact us today for more information, check out our eight locations in Ottawa, or book an appointment online!